In RTG’s great game of standard Blackjack, the dealer always hits on soft 17. You can split your hand whenever you get dealt a pair, and you can split aces, but split aces only get one more card before you must stand on that hand. You cannot re-split in this game. Doubling down is available at a cost equal to your ante bet. Insurance is available at a cost equal to one half of your ante bet when the dealer shows an ace. All bets push on a tie. The maximum bet in RTG Blackjack is 250 USD/GBP/Euro, and all bets are made with four chips – 1, 5, 25, and 100. These are just enough to bet any amount you want! When you win, blackjack will pay out 3:2, Insurance will pay 2:1, and a standard win pays even money at 1:1. All bets push in the event of a tie. If you play two hands, you ante separately for each hand, and you can bet different amounts if you like. Your first look at RTG Blackjack will have you smiling, because this game looks incredible. It runs fast and smooth even on the oldest computers, with cards flying around the screen, wasting no time getting to the table. Everything is easy to see and read, and the layout is well conceived. The table, chips, cards, and everything else look very nice and crisp, and are very realistic. Nothing looks cheap or cartoony – this is definitely a classy, well-made game! While RTG Blackjack lets you play two hands at once, this really just means you play twice as fast. If you do choose to play two hands, it might be a good idea to focus your wager on one, and use the other as a kind of ‘side bet’, perhaps just betting one credit on it. This side hand might end up being the big winner, but if it is the losing hand, then you won’t be out as much. Of course, if you have money to burn, go ahead and use both hands to fly through game after game in your race to get ahead! 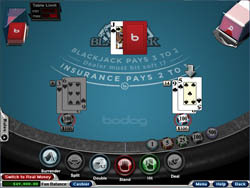 RTG Blackjack is superior to most online blackjack games out there today. It gives you the unique ability to switch between playing one or two hands whenever you like, and its graphics and gameplay blow away the competition. For good, old-fashioned blackjack fun with a well-made and good-looking game, look no further than RTG Blackjack!